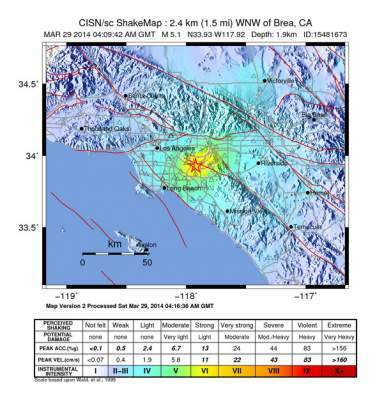 A preliminary report by the U.S. Geographical Survey (USGS) indicated that a 4.3 magnitude earthquake struck this morning at 5:54 a.m., centered in the Fontana, CA area. A Magnitude 5.3 earthquake struck on March 29, 2014, at 9:09 pm, 2 miles from La Habra, here in Orange County. It was widely felt in Los Angeles and here in Orange County.